Sometimes when i listen or read some arguements i simply shake my head in amazement at the simplistic opinions being thrown into the airwaves abi na cyberspace. There are many successful ex-footballers who plied their trade and retired in Nigeria, just as there are those who fell by the way side. And in the UK damn it is even worse, they too have those who failed to make or get a hold of life after retirement. The likes of Gascoigne remain an example. At the end of the day it does not matter where you retired, if you dont make use of the opportunity presented you will fail in life. The likes of Odegbami, Adokiye, CCC and host of other played and retired in Nigeria, and they are doing very well. There is a long list of former players doing their thing and surviving. There are many in Banjo's era who have died quietly in penury...it is not a case of here or there. A lot of diaspora Nigerians respond to calls to rebuild old schools, help relatives, are probably the countries only significant number of tourists bringing in much needed forex etc., etc. First, huh? Wtf has diaspora remittances/donations have to do with this topic? As for “respect”, you babble as if you are doing somebody else a favor by sending money to your own relatives (or to the parents that gave you life and nurtured you). Even on the subject of donating to your Alma Mater (and btw, many diaspora Nigerians are the beneficiaries of highly-subsidized and even free education), are you aware that alumni are the primary and biggest source of funding for many US universities and colleges? Nonetheless, if the reason that you give something is so that everyone can see it and “respect” you and do a public dobale, it a very sad self-commentary. Respect, my ARSEnal! This game was an "all hands on deck" game and featured recall of Usiyen, Andrew Atuegbu, Tunji Banjo, etc. Chiedozie was injured and did not make the trip to Nigeria. It was the game Where Odegbami claim of injured knee requiring surgery was contradicted by an independent doctor in Cardiff ( a Dr. David Jenkins). Other intrigues included Banjo demanding 6000 British pounds, reportedly, before playing against Algeria. There were plans to replace Odegbami as skipper because of the knee injury issue but that was later rescinded. Some long-distance Liverpool fans travelling by train to Saturday's Merseyside derby will have had their tickets checked by a man who once played in an FA Cup semi-final. Tunji Banjo still has a living to make with London Northwestern exactly 40 years after facing Arsenal in one of the biggest games in Leyton Orient's history. It's hard to imagine Harry Kane or Eden Hazard spending their retirement shuttling between Milton Keynes and Crewe, but Banjo hasn't got that luxury. In any case, that's not one of the worst shifts. 'The earliest start is 5am in Northampton which means I leave home at three', he reveals. 'I've been a footballer so I know the difference between that and proper work! Banjo was 18 and earning just £100-a-week when Second Division Orient beat Chelsea, Middlesbrough and Norwich to set up their semi with Arsenal on April 8, 1978. The favourites won 3-0 in front of 49,000 at Stamford Bridge and it still hurts. 'Their first two goals were fluky, deflected shots by Malcolm Macdonald,' says Banjo. He'd come on as a sub and is grateful there are pictures of him battling for the ball with Liam Brady because the match itself was a blur. Banjo, a strong-running midfielder, was among a group of young, black players at Orient who helped change the face of football. The most famous, Laurie Cunningham, left for West Brom in 1977 but John Chiedozie, Chris Hughton's younger brother Henry, Bobby Fisher and Kevin Godfrey remained. 'I had a bad experience at Bolton early on,' recalls Banjo. 'I was warming up to come on and got all this verbal abuse and bananas being hurled down. Black players supported each other. Banjo knew Cyrille Regis from London schools' football and was friendly with Cunningham, who later played for Real Madrid and Manchester United before his tragic death in a car crash in 1989. 'Laurie was never flash, always stayed down-to-earth. I bumped into him a few years after Orient. I walked into a bar in Muswell Hill and there he was! It was a lovely sunny day so we grabbed at a table outside and chatted about old times. At that time, Banjo was already a Nigerian international, eligible through his Dad. The trips to Africa were an eye-opener for the Londoner who found it a fascinating experience, but was startled to witness dead bodies in the street on one visit. On the pitch, he came close to qualifying for the 1982 World Cup. Nigeria were beaten by Algeria in a play-off and they went on to defeat West Germany in the finals the following summer. Banjo never became another Cunningham. He left Orient in 1983 to play in Cyprus where a bad ankle injury put paid to his dream of reaching the top. 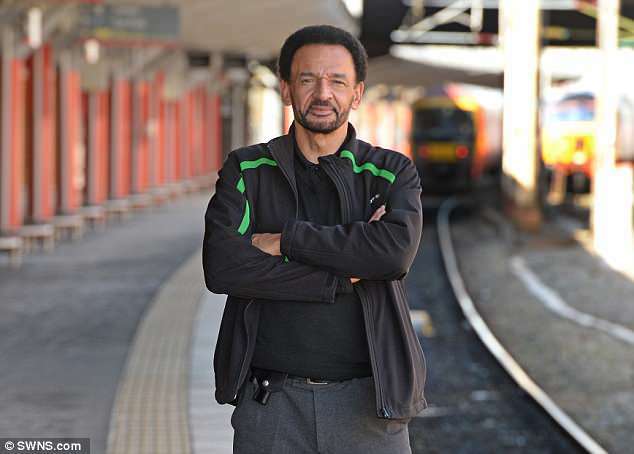 He drifted into non-league, retirement and a new life on the trains. In 2004, he moved to Stoke-on-Trent to keep his son away from London gang culture and it remains his home town today. 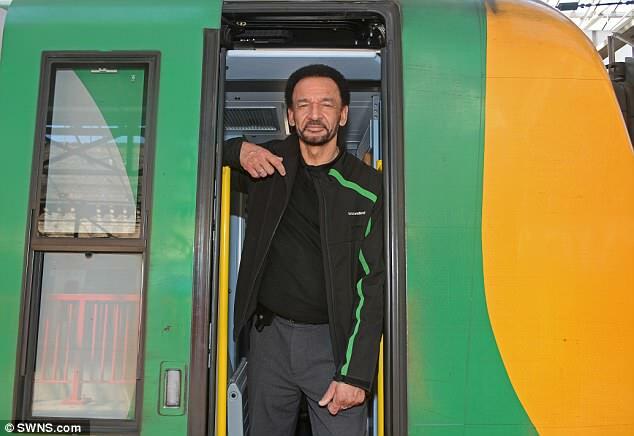 On the trains, he occasionally sees famous football names like Paul Ince on board. He recognises them, but they haven't a clue who he is and he keeps quiet. VB, you’re a picture of contentment! Thank you! to arguments that have raged here, year on year. Kudos to the man for earning an honest living. Wonder if the likes of Emenalo could "hook him up" with soccer gigs (if he's interested and capable, of course). CIC, Sir V, DaMunk et al should invite him to Mama Calabar The guy might not even know that we remember him. I remember ImehJunior relating how Ironbar Bassey was shocked to hear that folks knew and remembered him from his exploits for Naija. You are quite right. Quite often these guys assume that no one cares and that they have been forgotten. It will be a nice gesture to invite the guy and have conversations with him. I am certain he will be excited and will not forgotten such gesture. I actually had a phone conversation with him while researching my book... he was a Bus driver at the time. I remember he spoke fondly about his time with the Eagles... was a great (though sometimes eye opening) experience for him. We promised to meet up for a drink sometime but never got round to it. You know it is not everyone who wants to continue with the stressful life of football. People often think that just because you are no longer in the game it is because you could not stay in. I dont know about Tunji, but trust me some of us walked away from it all of our own free will. As much as i miss the gig, the fact remains i hate the stress that surrounds the game, it is all glamour on the surface but when you are deep in it, you have to be made of certain stuff to enjoy the whole stress and hassles. If you are a sensitive person, the earlier you can walk away from it the better. The day i walked away...i gave away all my kits, everything i had to do with the game i gave it away to make sure i never come back. For two years i stayed away from the game and everyone in the game that i knew. My team back then offered to send me to NIS for a coaching course, the coaches persuaded me to do it...I refused because i was done with the wahala that being in the game piles on you. Simply put that lifestyle was not for me anymore. Look at the face of that man, he is contented and happy with what he is doing, looks like all that matters to him is his family! If he was "driving" a plane, he would be called a Pilot/Big Oga. Also agree. However, would be nice for the UK guys to invite him to Mama Calabar...just to show that many Nigerians remember our past players and appreciate them. For every Segun Odegbami there are hundreds of former ballers that are dead broke or dead with no skills or safety net to fall back on. 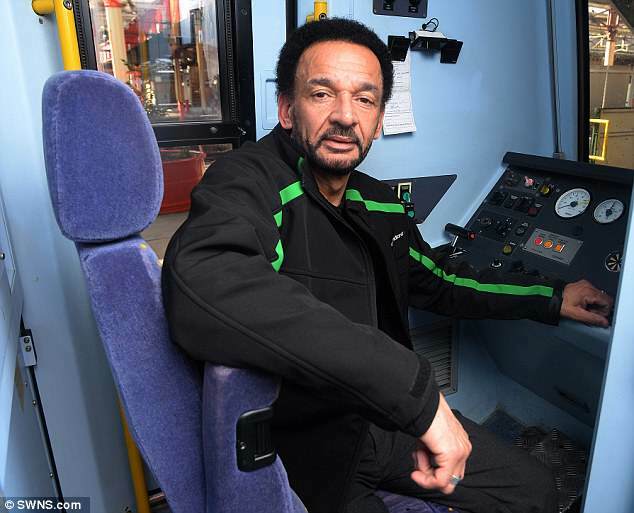 He is better off driving train in London that driving for Lastma in Lagos. And you think there are no former ballers "dead broke or dead" in the UK?! Football proffers an OPPORTUNITY, not a guarantee of a life of luxury. Many Nigerian footballers have used it as an opportunity for education or a decent trade and profession. Nonetheless, that is besides the bigger point. If you want Nigeria to be as viable as the UK, roll up your damn sleeves, rather than sitting on the sidelines and point fingers, babbling incoherently. It's YOUR country too! We have one example here on CE. Oloye did not play in Europe and was not paid thousands of pounds a week but I'm sure the exposure he got from football has helped him to make a decent career in Ireland. The naija ratio is higher for the same reason why many who went to school and have degrees end up without jobs. The argument could even be switched around to say that with all the opportunities available Tunji could have fared better, but like i said, what matters in the life of a man is contentment...the rest is irrelevant.